Piotrek: It’s been a month since Jessica Jones’ Second Season’s premiere and finally we sit down to cast our judgement 😉 I must admit the show did not induce particularly strong feelings in me this time, contrary to the first encounter. Not disappointment, but also not enthusiasm. After an awful Iron Fist and mediocre – at best – Defenders, we got thirteen watchable, but largely forgettable, episodes of superhero TV. As a new industry standard, it’s cool, but in comparison to, say, Marvel’s The Punisher, to stay within Netflix/Marvel universe, nothing special. My main problem with Season One was that it did not show us Jessica doing the actual detective work, that the Killgrave was defeated largely by his fascination with our heroine, not her skills and efforts, and that the show was not as connected with other Netflix Marvels as it should have been, given its source material. No Murdock, Patsy as a poor substitute for Jessica’s true best friend – Carol Danvers AKA Captain Marvel… it was not bad TV, but not a great adaptation of one of the most interesting comics I’ve ever read. Ola: I’ve forced myself to watch the second season of Jessica Jones only for the purpose of this review :P. I actually think I preferred the first season, despite its vivid and undeniable inferiority to the comic books. The second season suffers from a bad case of an ideological bout of righteousness. Don’t get me wrong – I supported “#Me too” action, because I thought it was an unfortunately necessary, if overly heated and not always fair, debate. But hitching the JJ2 wagon to “#Me too” action seems, firstly, unnecessary, and secondly, in bad taste. The storylines of Alias, i.e. Jessica Jones comic books, can easily defend themselves. They don’t need additional repetitions or variations of the themes already covered, abundantly, I might add, in season one. Piotrek: And the winner of my personal favourite tv series of the year award is… Stranger Things, again. Punisher is a close second. It means a lot, considering in 2017 I’ve seen American Gods, Legion, Samurai Jack’s final season and discovered Rick and Morty. It was even better than this little beauty that sparked my hopes a few years back. I might go as far as to say Netflix might have saved its part of the MCU with this, although it is not a typical superhero show. And it’s not as linked together with Jessica Jones or Daredevil, Frank Castle wasn’t even part of The Defenders (and good for him 😉 ). It is a TV series based on a Marvel comic, part of the geek takeover of the pop-culture of our times, but mostly it is a great story about, and commentary on, the war on terror, military/society relations, and, most of all, individuals involved in all this. Ola: Huh, for me it’s the other way round: Punisher just a hair breadth before Stranger Things, right up there with the first season of Daredevil among the very best MCU has to offer. 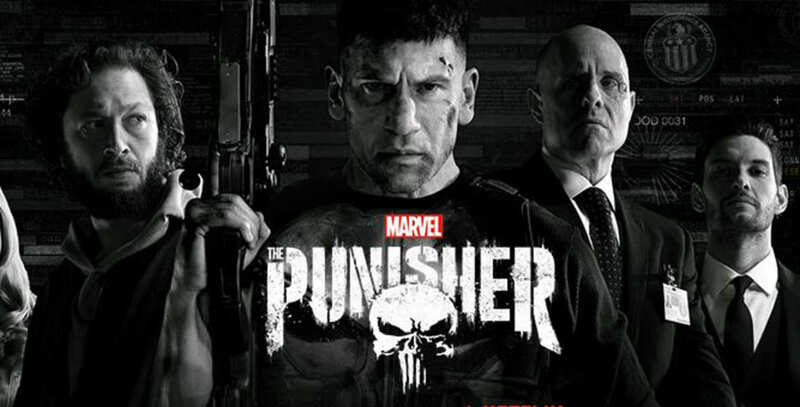 Punisher is the comic-based TV series I’ve been waiting for: dark, gritty, realistic, tackling vital and controversial themes and topics in a way that is both respectful and immensely entertaining. It is closely linked with Daredevil, both in the overarching theme of violence as a means of justice, with DD and Punisher two sides of the same ethical coin, and in the supporting cast of characters – most notably Karen Page, who plays an important role in both series. It’s all over the internet already, and deservedly, but with all the attention we paid Andrzej Sapkowski’s universe lately… here’s Tor.com version with all the details, and here the statement of Platige Image, one of three forces behind the planned series. 1) Netflix is great. Its series – less consistently good than HBO’s, but there are hits aplenty. Same amount of care and effort they dedicated towards Daredevil or Stranger Things should give Game of Thrones a worthy competitor, at least from a genre lover’s point of view. 2) Platige Image means Tomasz Baginski. Big name in animation, not only in Poland. Oscar nominee (for this), and, that is important, author of cinematic trailers to Witcher games. Great credentials for someone like me, a huge franchise fan, but will Grandpa Sapkowski be happy? He apparently is, despite his lack of enthusiasm towards games. Well, he’ll get more money out of this, while having more influence, as creative consultant. Good to have author involved, although it did not help Shannara. 3) Producers? Guys behind The Expanse, and that is more good news. Expanse is a great genre show, with very good special effects done on budget, so chances of Witcher being a success are significant. It’s already said to be a multi-season enterprise (“Bagiński will also direct at least one episode of each season”). Sweet. If you’ve read the books, or even just our reviews, it’s clear there is a lot a lot potential. Short stories provide excellent basis for an introductory season or two, and then the novels… complex, sophisticated stories with likeable characters. I’ve never be so excited about stuff like that, not even when GoT started, Witcher is more important for me personally. If Netflix screws that up, I’m cancelling my subscription.